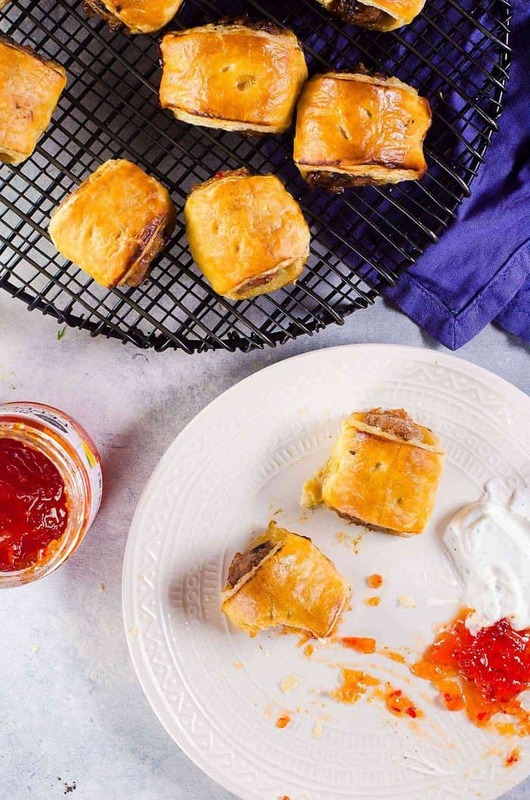 Quick and Easy Sausage Rolls with just 3 ingredients – puff pastry sheet, sausages, and a sweet or savory jam/jelly/spread. You can customize these easily with your favorite flavor pairings, and they can be made ahead and frozen for later too. Perfect for holiday entertaining, as an appetizer or as a brunch or lunch snack! I adore sausage rolls, especially pork sausage rolls. But living in the US, if I want sausage rolls, I have to make them myself. I’ve shared my recipe for gourmet caramelized apple and fennel pork sausage rolls on the blog before. Well seasoned ground pork filling mixed with caramelized apple and roasted fennel spice and then wrapped in a buttery, flaky puff pastry… you can see why I love sausage rolls! But if you’re looking to make a ridiculously easy, super quick, yet delicious as ever version of sausage rolls – then this is the recipe for you. 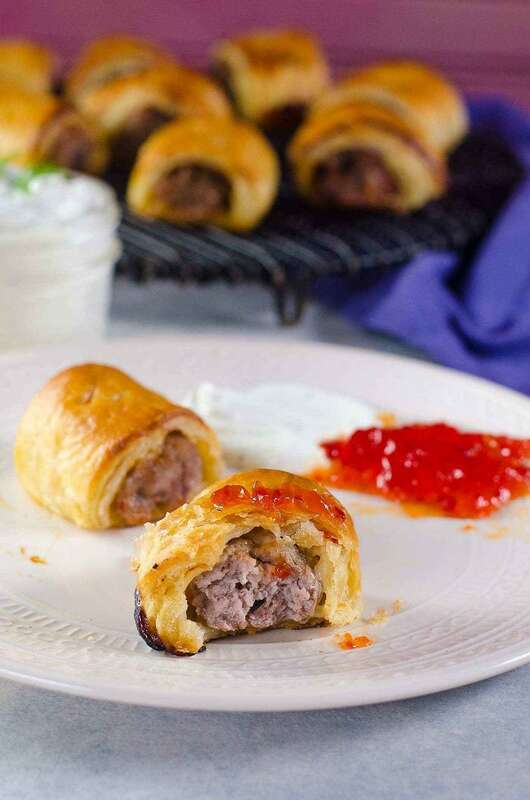 These Easy Sausage Rolls with just 3 ingredients come together quickly and freeze really well. 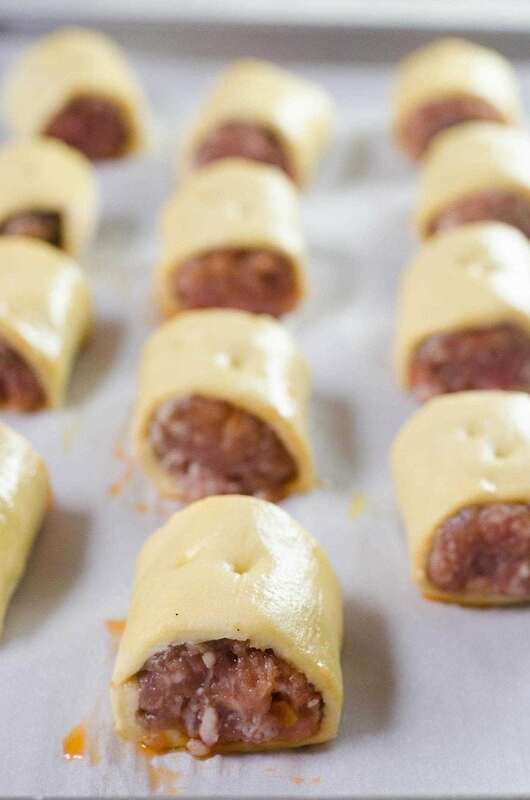 So you can make a batch (or two or three) and then freeze them for later, and get them ready for whenever those sausage roll cravings hit (yes, they are a real thing), or when you suddenly find yourself with company and want to whip up a quick appetizer/snack. Plus, they taste just like gourmet pork sausage rolls. 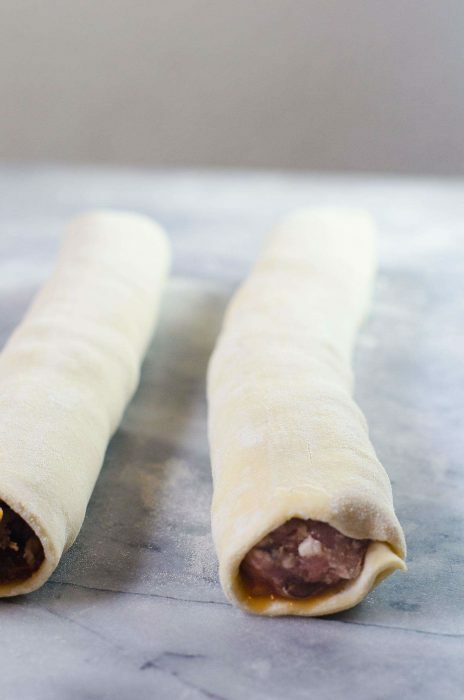 Here are the shortcuts that you can take to make these quick, easy sausage rolls. Shortcut 1 – Store-bought puff pastry. This is a no brainer. While homemade puff pastry is superior in taste, store-bought puff pastry is a worthy time saver. But if you’re interested in making quick and easy homemade rough puff pastry, I’ve got a delicious recipe for that right here. Shortcut 2 – Store-bought sausages. I’m not talking about hot dogs here. I’m talking the real deal, beautifully seasoned ground meat that comes in casings. You can use your favorite flavor – pork sausages, chicken sausages, lamb sausages, or beef sausages. As long as they are not pre-cooked sausages, they will work for these easy sausage rolls. If you do use pre-cooked sausages, these will be called pigs in a blanket.The difference between pigs in a blanket and sausages rolls is the sausage that you use. Pre-cooked hot dogs for pigs in a blanket, and unprocessed sausages for sausage rolls. Shortcut 3 – store-bought savory or sweet jam or jelly. I prefer to use a fruity, sweet and savory spread with some heat. But a lovely caramelized onion spread, or red pepper jelly works well for more gourmet sausage rolls too. If you’re making these easy sausage rolls for kids, or adults who don’t like it spicy, you can use a sweet spread like apricot, berry, fig or quince. 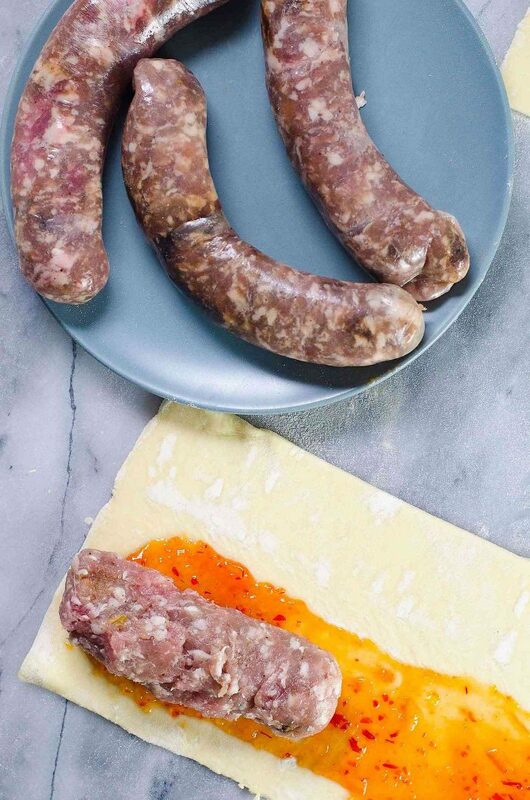 Something that will complement the savory flavors of your sausage filling. 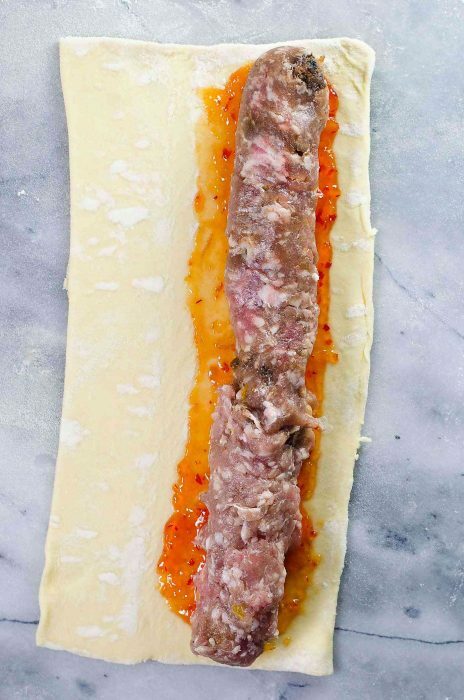 For these easy sausage rolls, I’ll be using apricot and pork sausages, and a blood orange and chili spread. I love this combination because the chili adds a nice kick, and the apricot and orange provide a nice sweet and sour balance to the pork. Another great pairing for Thanksgiving and Christmas would be use turkey sausages (or pork sausages) with cranberry relish or sauce! OR, how about beef sausages with a fruity BBQ sauce? Or lamb sausages with a mint and chili jelly? Pork or chicken sausages with apple or this mango jalapeno jam? Or chicken and basil sausages with this bourbon tomato jam? The combinations are endless and you can be really creative with those flavor pairings. 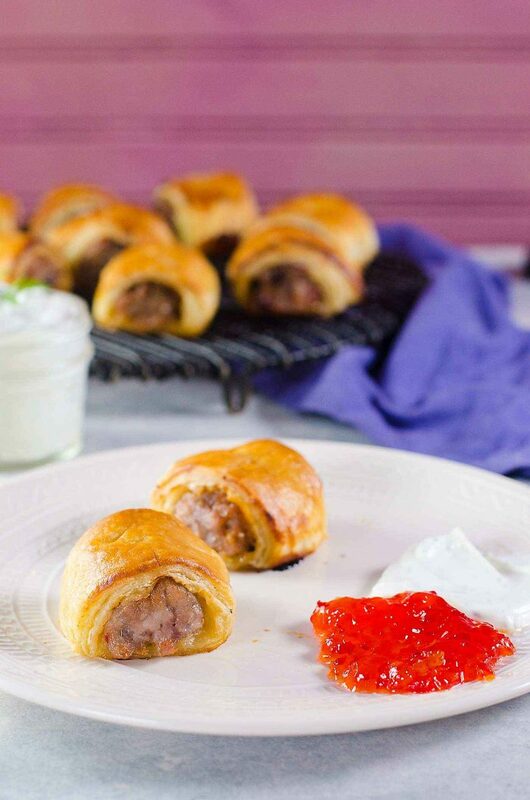 Just make sure to use some flavorful sausages for these easy sausage rolls. I’ve used regular pork brats for these before and those work really well too! Now that I’ve suggested some ways in which you can customize these easy sausage rolls, let me show you how easy it is to make them! Once you thaw out the puff pastry, place it on a lightly floured surface. Cut it in half. Spread your favorite spread on the pastry sheet. Cut and carefully peel off the casing while keeping the sausage whole. Place the sausage (without the casing) on the puff pastry sheet along one long edge (see recipe video). I needed 1 1/2 sausages for one half of the puff pastry sheet. So it’ll be 3 sausages for the whole puff pastry sheet to create 2 sausage roll “logs”. Each log can then be cut into 3 – 4 (for larger sausage rolls), or 6 (for mini sausage rolls). At this stage, these pork sausage rolls can be frozen. Place each sausage roll on a sheet pan, cover tightly with plastic wrap and freeze. Once frozen, you can transfer them into air-tight containers and freeze again until needed. You will of course need to adjust the cooking time in the oven depending on whether you bake them fresh or from frozen (all information available in the recipe). Whichever flavor combination you use, I guarantee these easy sausage rolls are perfect for holiday entertaining! 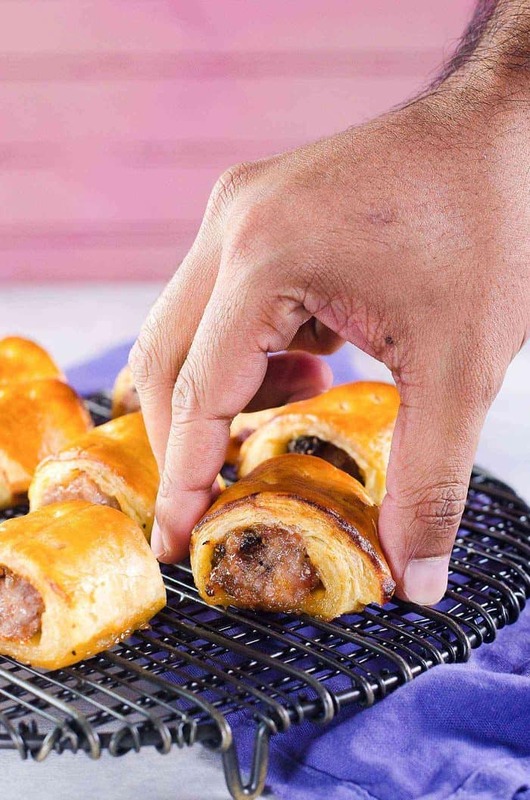 Use gourmet sausages and flavors for fancy sausage rolls, but keep it simple for a quick and easy snack for kids and adults. 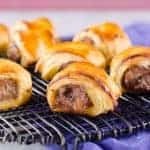 Quick and Easy Sausage Rolls with just 3 ingredients - puff pastry sheet, sausages, and a sweet or savory jam/jelly/spread. You can customize these easily with your favorite flavor pairings, and they can be made ahead and frozen for later too. Place the puff pastry sheet on a lightly floured surface. Roll it out a little to extend the sheet, but don't make it too thin). Cut the pastry sheet in half. Set aside one half of the pastry sheet. 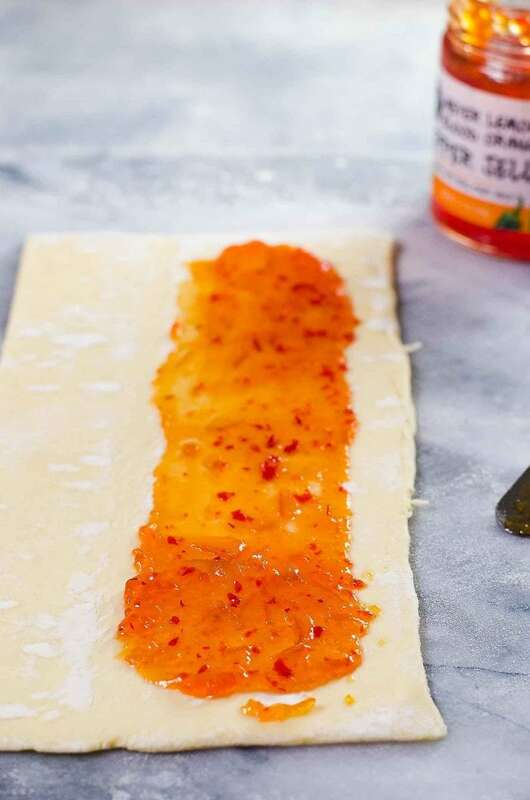 Spread about 1 ½ tbsp of the spicy fruit relish/spread closer to one edge of the puff pastry sheet (length-wise). You may need more depending on the relish that you're using. Using a paper towel, blot the sausages to remove any excess moisture. Cut and carefully remove the casing from the sausages. Place the sausage filling along the pastry sheet (on top of the relish). Brush the other end of the pastry sheet with water. Tightly roll the sausage roll toward the end that you brushed with water. Pinch the edge to seal. Turn this sausage roll "log" over so that the seam-side is facing down, and cut the sausage rolls with a sharp knife - 6 portions (see recipe video). Place the sausage rolls on the prepared parchment paper. Brush the top with egg wash (optional) and make 2 slits on top. Repeat with the rest of the puff pastry. Bake in the oven for 20 - 25 minutes, until the puff pastry is golden brown and puffed up, and the sausage is cooked through. Remove from the oven, and let them cool down slightly. Serve warm with dipping sauce or tomato sauce. Cut the prepared sausage rolls into 6 portions. Make 2 slits on top and place the sausage rolls on the prepared baking sheet. Cover the baking sheet with plastic wrap and place in the freezer. Once the sausage rolls are frozen, transfer them into an air-tight container and freeze again until needed. When ready to bake, preheat oven to 375°F. Place the frozen sausage rolls on a parchment paper lined baking sheet. Brush the tops with an egg wash (optional) and bake in preheated oven for 30 - 35 minutes, until the pastry is puffed up and golden brown. If you liked this recipe for easy sausage rolls (pork sausage rolls), don’t forget to subscribe for new (and free) recipes by entering your email address on the side bar (and get all these recipes delivered straight to your inbox), so you don’t miss out on a thing. You can find me on FACEBOOK, TWITTER,INSTAGRAM, PINTEREST, YOU TUBE and GOOGLE-PLUS too. This is the same way as I make mine at home, my 2 kids and hubby love them, I make a batch of 12 and they are all gone before they even get chance to cool down. OMG! This is so smart – almost like a quick sausage wellington! And I love the jam idea. I am totally going to make this! These are absolutely delicious and so very easy to make! Thanks for the recipe! These were delicious and so easy to make! I went crazy buying different jams/spreads but ended up deciding on a balsamic onion jam with spicy Italian sausages. These would be a great brunch item too. Will definitely make often!